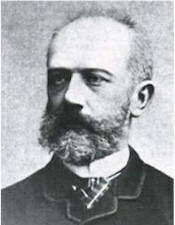 Among the works by Peter Ilyich Tchaikovsky (1840-1893) for the voice, the catalog of choral works is small compared to the listings of opera and song. But these choruses have a wealth of gorgeous melody. I Will Praise Thee, Alleluia is among these works. 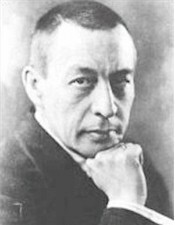 Sergei Rachmaninoff (1873-1943) was one of the greatest composers of the last century and church music was a powerful influence throughout his life. He wrote Bogoroditse Devo (Ave Maria) as part of All-Night Vigil, (Vespers) the night long service celebrated in Russian Orthodox churches on the eve of holy days. He wrote the entire work in two weeks and it was his last and greatest liturgical composition. Rachmaninoff was equally famous as a pianist and composed many pieces for piano. "Rhapsody on a Theme of Paganini" is a set of 24 variations on Italian composer Niccolo Paganini’s Caprices for solo violin. The Pie Jesu is adapted from the most prolific variation, the eighteenth and is set to lyrics by American composer John Leavitt. In the Orthodox Church, the word "Liturgy" refers specifically to the Eucharistic service – in the West, its equivalent is the Mass. As the early church developed, there arose in the East a number of Liturgies, but only four forms are in use today. One of those is the Liturgy of St. John Chrysostom which is used on Sundays and weekdays. Hospodi Pomilui (Lord, have mercy) is sung many times throughout the Liturgy. 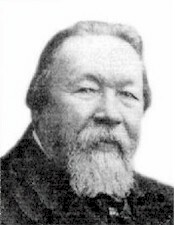 We have included a setting by Grigor F. Lvovsky (1830-1894) - a lesser-known Russian composer. Bless the Lord, O My Soul (Psalm 103), also from the Liturgy, is an a cappella arrangement by Mikhail Ippolitov-Ivanov (1859-1935). Ippolitov-Ivanov's works include operas, orchestral music, chamber music and a large number of songs. 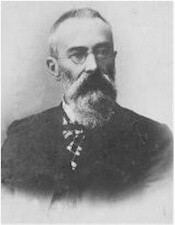 His style is similar to that of his teacher Rimsky-Korsakov. The text of the Cherubic Hymn is one of the most famous and frequently set texts of the Liturgy. Today we sing a setting by Dimitri Bortniansky. 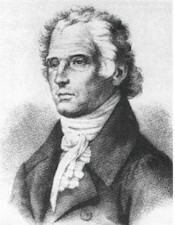 He was born in the Ukraine in 1751 and was a prolific composer, writing several operas and a large number of sacred works. He died in St. Petersburg in 1825. The musical treasures of St. Petersburg are, undoubtedly, an incredible wealth. It was St.Petersburg that gave the world the "Mighty Five" – a unique union of composers of sheer genius, without which the world of music would be incomplete. Nikolai Rimsky-Korsakov (1844-1908) was one of these composers. He is noted for creating music that is striking and dynamic. Russian Easter Canticle is a choral adaptation of his Russian Easter Overture. 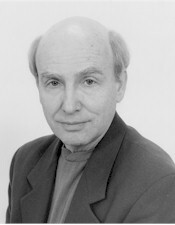 The work is based on actual liturgical themes and is set to lyrics ("Alleluia") by American composer William Sisson. The Russian people have created many expressive and lively folk songs, which have endured through upheavals of the past and remain popular today. In rhythm, melody and polyphonic treatment can be seen the basic Slavic element and the contribution from Byzantine and Mongolian cultures. For centuries the Birch Tree has been a symbol of Russia. It is one of the most beautiful trees in the world. Many folk songs and folk tales incorporate the birch tree. (note: Tchaikovsky used it as the major theme for the last movement of his 4th Symphony.) Cossack Lullaby uses the poem of Mikhail Lermontov. Work songs are among the most ancient genres of folk song. Barge haulers sang "Ey, ukhnem!" (derived from the exerted "Ukh" as they dragged boats upstream. Song of the Volga Boatmen has become the most famous Russian work song. Kalinka, (Snowball Tree), with its bold and spirited refrain, is designed from an old Russian dance form. It continues to enjoy a great popularity all around the world. Described by its composer, Rimsky-Korsakov, as a magic opera ballet, Mlada is very much a pretext for displaying pageantry, ballet sequences, and scenic effects. It is set in Retra, city-state of the Polabians or Baltic Slavs. The Procession of Nobles takes place at the beginning of Act II when the Polabian princes assemble at a national festival. Tchaikovsky’s The Nutcracker has been a perennial Holiday concert favorite for many years. Composed for the Imperial Ballet at St. Petersburg, it was one of Tchaikovsky’s last major works. 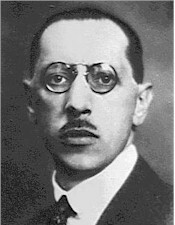 Waltz of the Snowflakes contains a treble (off-stage chorus) – singing without words – as the snowflakes dance in the final scene of Act I.
Igor Stravinsky (1882-1971) composed his opera Oedipus Rex about a subject from the familiar myths of ancient Greece. Gloria! comes at the end of Act I and reprised at the beginning of Act II. It is a glorious chorus extending greetings and accolades to the wife of Oedipus, Queen Jocasta. It is brief - in fact the entire opera runs less than an hour. Perhaps this reflects Stravinsky’s legendary quote: "Too many pieces of music finish too long after the end." Our exceptionally talented accompanist, Joseph Jacovino will be highlighted performing Rachmaninoff’s Prelude in C# Minor. This very famous piece was composed when the composer was just eighteen years old. This very famous piece was composed when the composer was just eighteen years old. Polovetsian Dance and Chorus by Alexander Borodin (1833-1887) – the oldest of the "Mighty Five" - is from one of Russia's best-known operas Prince Igor. The opera is set in the 12th century where Igor, a southern Russian prince is captured in battle by the Khan of a nomad tribe, known as the Polovetsi The main melody of the first dance was borrowed by the musical Kismet and is familiar as "Stranger in Paradise". The second part is music for the slaves to entertain the imprisoned Prince. 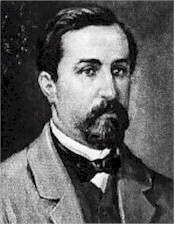 The opera was unfinished at the time of Borodin’s death. It was completed by Rimsky-Korsakov and Borodin’s student Alexander Glaznov in 1890.